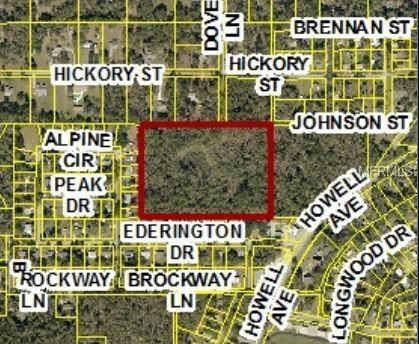 13 wooded acres currently Zoned Agriculture. This property adjoins 8.5 acres that fronts on Howell Avenue. Seller would sell both parcels together. From downtown Brooksville, go north on Main Street which turns into Howell Ave to left on Hickory St, then left on Dove Ln to end. The approximate monthly Principal & Interest payment for this property would be $771. This payment is based on a 30-year loan at a fixed rate of 4.12 % with a down payment of $14,500. Actual lender interest rates and loan programs may vary.